You can use any size of pumpkin for this dinner in a pumpkin recipe, but it’s easiest to do with the baby varieties. Then you can serve one stuffed pumpkin per person and it looks really impressive. For large pumpkins, increase the cooking time. I’m lucky enough to have a local market in my village and a grower who specializes in lots of lovely varieties of pumpkin. My favorite was this lovely sweet golden nugget baby pumpkin. I hope she grows lots of those again next year, or I’ll have to get some seeds from her and convert even more of my garden! If you want some help you should check out my tutorial on how to grow pumpkins. I filled this one with a lovely aromatic minced beef which filled the house with it’s delicious aroma. Perfect for a cold winter’s night. Choose one small pumpkin for each person, or share a slightly larger one between two. Any baby variety will do. You could also use half a butternut if you need to. Don’t worry about a lid and just scoop out a slightly larger hole. This golden nugget baby was enough for two people. Warm up your oven to moderately hot – about 200 C, 400 F or Gas mark 6. You will need to increase the ingredients if you are doing more than one or two small pumpkins. Fry up the ground beef with the onion, mushrooms and garlic. Add a little water and a stock cube to form a gravy, but don’t make it too wet. 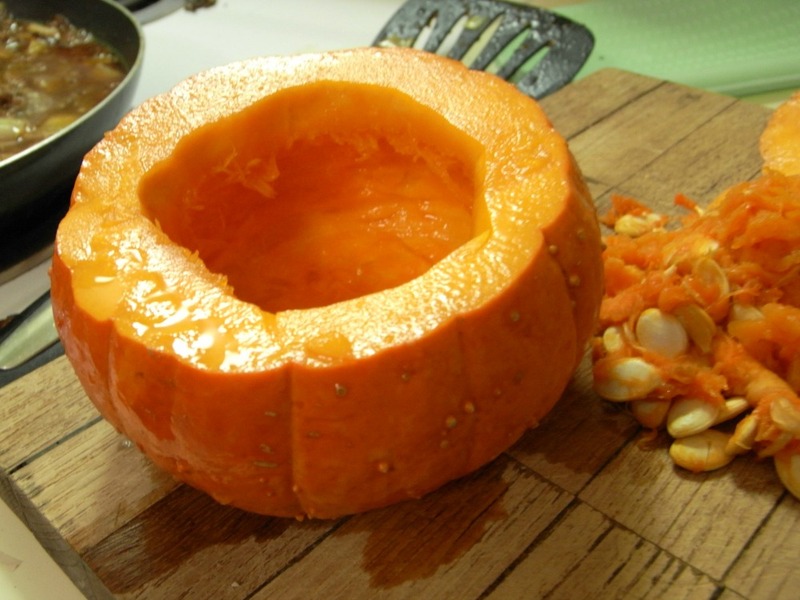 Create a bowl with your pumpkin by cutting off the top and taking out the seeds. Tip: If you cut a couple of notches as you take off the lid, it will stay on in the oven better. Otherwise if it falls off, fix it on with a wooden or metal skewer or toothpicks. 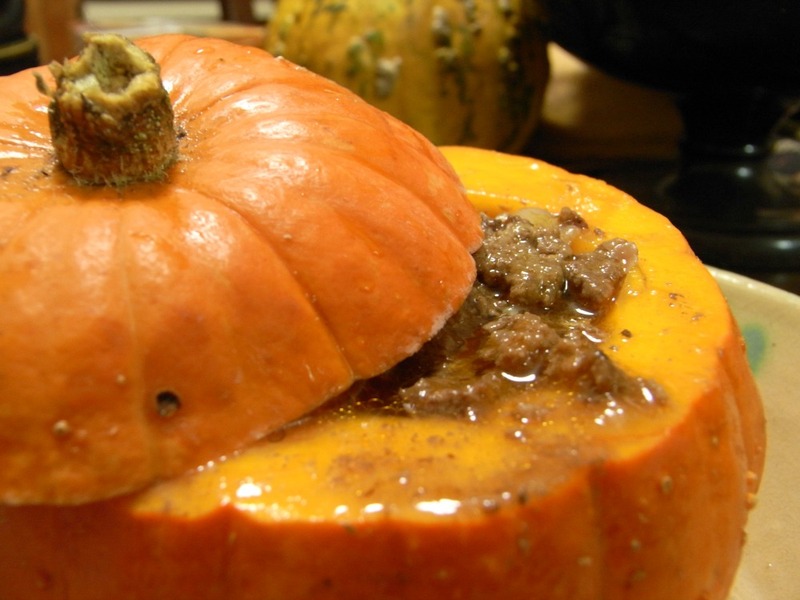 When your beef is cooked through, spoon the mixture into the pumpkin and put the lid back on. Bake in the oven for about half an hour. Test the pumpkin flesh with a knife to see if it is soft. Larger pumpkins will need a bit longer. 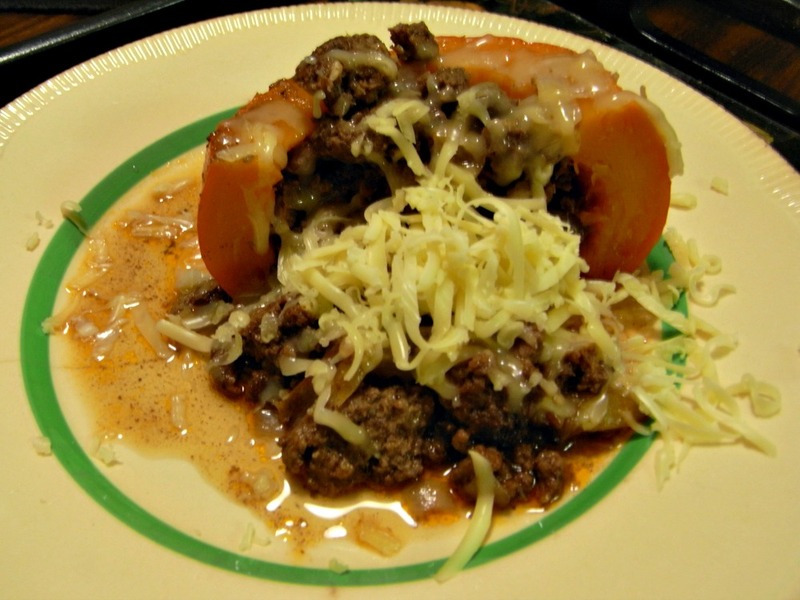 When serving, take the lid off and grate a little tasty cheese on top. 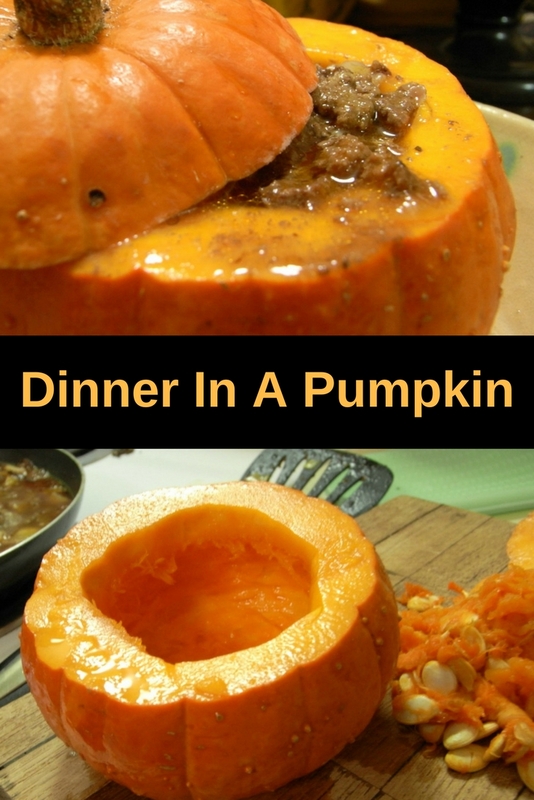 My mum used to cook this, using what is called a ‘trombone’ pumpkin. So I tried this a couple of weeks ago, using a Kent pumpkin, sliced off the top and took the seeds and some pumpkin flesh out. In a frying pan I cooked onion, 500 grams (1/2 pound) of mince meat, diced carrots and peas, with my usual flavourings, mixed herbs, Worcestershire sauce, pepper and salt and then added it to the pumpkin. I put the lid back on and into the oven, close to 1 hour at 180 or 190 degrees. It was absolutely sweet and delicious. Going to do it again next week. I may add as side dishes, some mashed potatoes or sweet potatoes. I have been eating this for years and my addition is par-boiled rice or cubed potatoes. Talk about one pot meal.